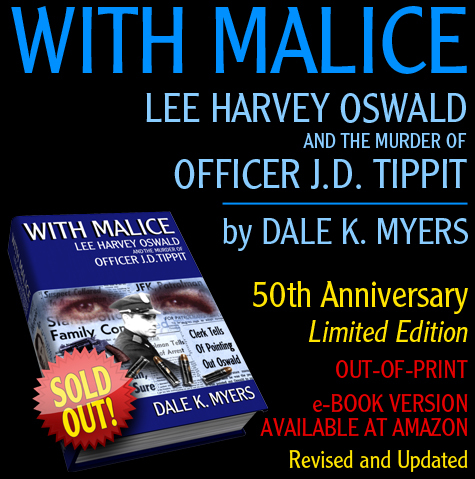 (MILFORD, MI) - Oak Cliff Press, Inc., is proud to announce the publication of a 50th Anniversary Limited Edition of With Malice: Lee Harvey Oswald and the Murder of Officer J.D. Tippit by Dale K. Myers. This revised and updated edition of the critically acclaimed 1998 classic includes 140 pages of new text, new rare photographs, an expanded appendix, a new comprehensive index, and much more. With the generous cooperation of the extended Tippit family, this 2013 Second Edition contains a significant update of the J.D. Tippit story - from his boyhood near Clarksville, Texas, to his tragic and untimely death in the Dallas suburb of Oak Cliff. This limited edition book is now shipping.